2.5 x 1.5 x 1" 3 x 2.25 x 1" 3.5 x 3.5 x 1" 3.5 x 3.5 x 2" 5.5 x 3.5 x 1" 6.5 x 4.75 x 1" 7.5 x 5.5 x 1" 7 x 5 x 1.25" 8 x 2 x 1" 8.5 x 5.5 x 1.5" 9.5 x 6.5 x 1.5" 10 x 7 x 2" 11.25 x 8.75 x 2"
These 3x2x1" boxes have white swirl bases, clear lids and white interiors. Boxes contain 100% recycled boxboard which is the largest component of the box by weight, does not include paper outer wrap. These empty boxes do not have synthetic fiber fill included. Made in the USA. 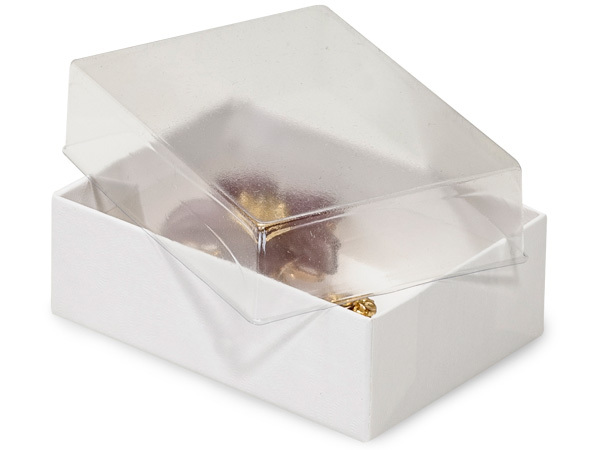 Clear Lid Display Boxes are great for gifts that need to be seen! Choose from chocolate, kraft or swirl white base. Boxes have rigid base bottoms and clear vinyl acrylic lids. These 2-piece boxes are superior quality and are available in popular sizes. Perfect for greeting cards, stationery, packaged gourmet products and bath & body. Base interior box board is 100% recycled. These boxes do not have synthetic fiber fill included. Made in the USA. These boxes can be made with most any custom printed or gift wrap base. Contact our Custom Print Department for details at 1-800-547-9727 ext. 4.